Engagement of employees is a critical factor to producing great bottom line results. This shows the influence that expectations have on performance. Whenever you form an expectation of an employee, you begin to act differently without realising it. This altered behaviour signifies to your employee your expectation, and when repeated consistently, the employee’s behaviour eventually meets that expectation. There are five areas to focus on. Involvement: Include your employees in a consultative discussion prior to setting your expectations to get their buy-in early and to give you beneficial feedback before it’s too late. Clarity: Once the expectations have been set, they need to be specifically articulated. The clearer they are in your employees’ minds, the higher then are the chances they’ll be met. 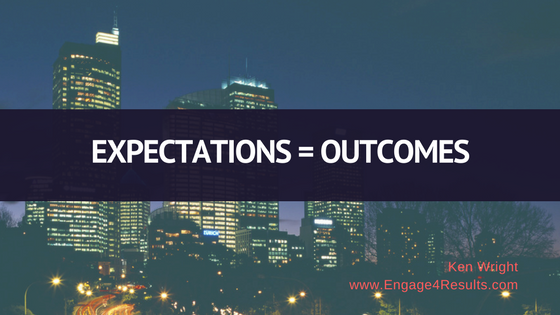 Language: The words you use when setting expectations have more power than you imagine. There’s a big difference between “I want you to” and “I believe you can”. Linking: For your expectations to be embraced and owned by your employees, find some way to connect these expectations to your employees’ ambitions, key drivers, and values. It all comes down to this: what you expect is really what you get……This type of focus will create engaged employees.